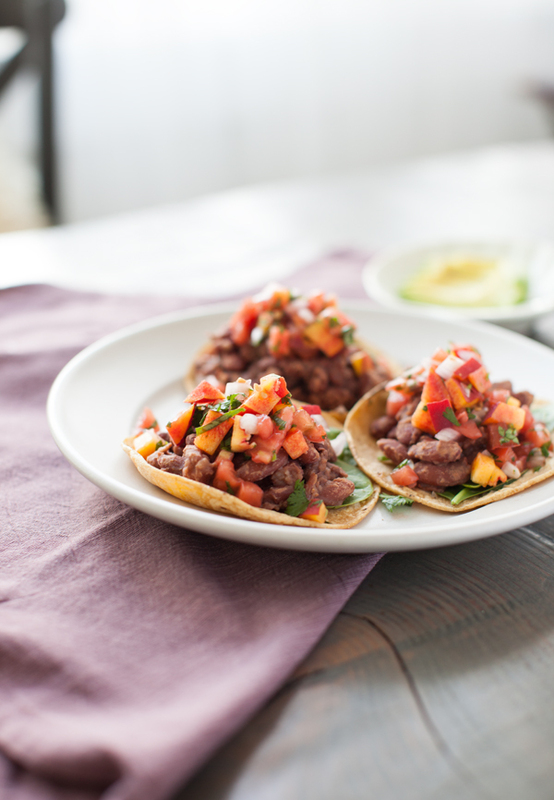 This blog post and curried red bean tacos recipe is sponsored by Camellia Bean company! 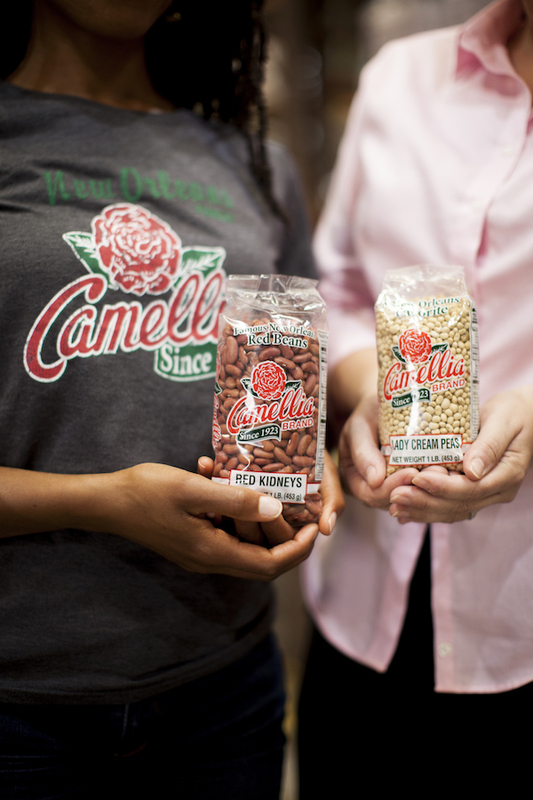 When I was in New Orleans on our cross country road trip we toured the Camellia headquarters, and got a great goodie bag of beans. Make sure to check out my New Orleans travel video to see our Camellia adventures, and all the great food we ate when we were in town! We finally made it from New York City to LA. Three weeks and 4,000 miles later, we’re Angelenos. So far so good…well, kinda. Before we move into a place of our own I’ve been taking advantage of this lovely and bright kitchen. 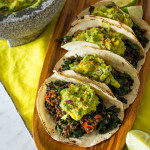 I don’t have a ton of time to cook with all this apartment hunting, so I created this simple recipe: curried red bean tacos with a sweet and tangy peach salsa. At the second one we bought some super flavorful grape tomatoes and some very tasty and fresh olive tapenade. New York has terrific farmer’s markets, but the produce is limited much of the year. Here in southern California there’s always a bounty! 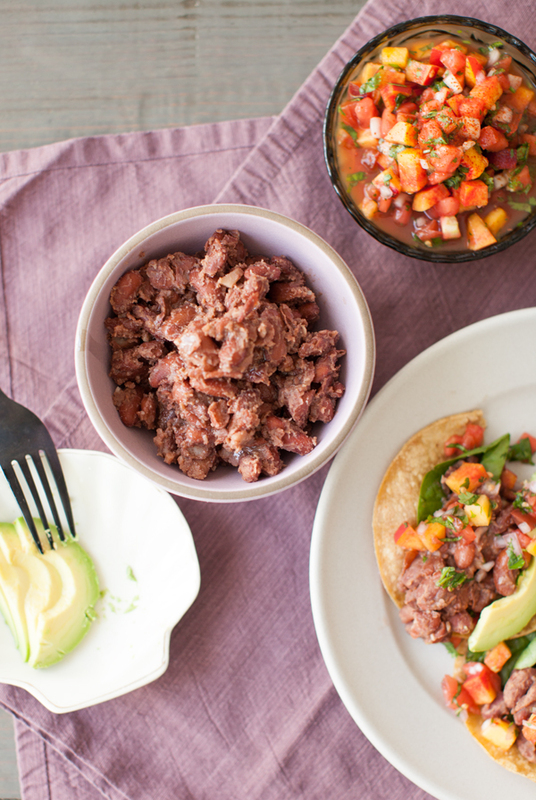 I knew I wanted to use these Camellia red beans in a taco, but I wasn’t quite sure how to prepare them until I picked up all these goodies at the farmer’s market. It happens all the time: I’m feeling uninspired, then I visit a farmer’s market and my creativity is unlocked. 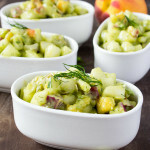 The red beans are cooked to perfection with garlic and curry powder; while that’s cooking you can make your peach salsa. Serve the beans and salsa in the freshest corn tortillas you can find, and you’ve got yourself a stellar and very pretty meal! On to the recipe. I hope you enjoy!! 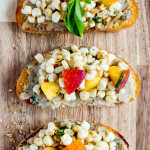 Purchase Camellia Beans on their website https://www.camelliabrand.com/ or at your local grocery store if you live down South. Combine the soaked red beans and the water or vegetable broth to a boil in a pot. Reduce the heat to medium-low, and simmer for 45-60 minutes, until the beans are tender. Keep the lid ajar. Check every 20 minutes or so to make sure the water hasn't cooked out. About 30 minutes into the cooking, add the minced garlic. When the beans are tender remove them from the heat, and stir in the curry powder, salt, and grapeseed oil. Season to taste with more salt. Combine the ingredients in a mixing bowl, and toss well. Season to taste with more salt and cayenne pepper. Warm the corn tortillas in the microwave, on the stove, or in the oven. To warm them in the microwave: wrap the tortillas in a damp paper towel and microwave for about 15 seconds until soft and hot. To warm them on the stove: simply place them on the stove's gas flame. They'll soften and brown on the corners. Warm each side for about 10 seconds. Keep the tortillas warm by wrapping them in a clean kitchen towel until ready to use. 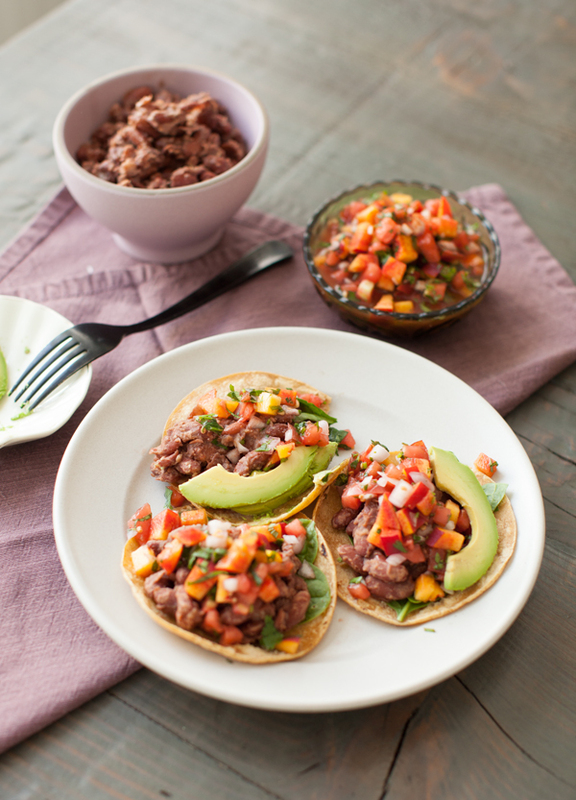 Fill the warm corn tortillas with a handful of spinach, topped with the curried red beans, peach salsa, and avocado.